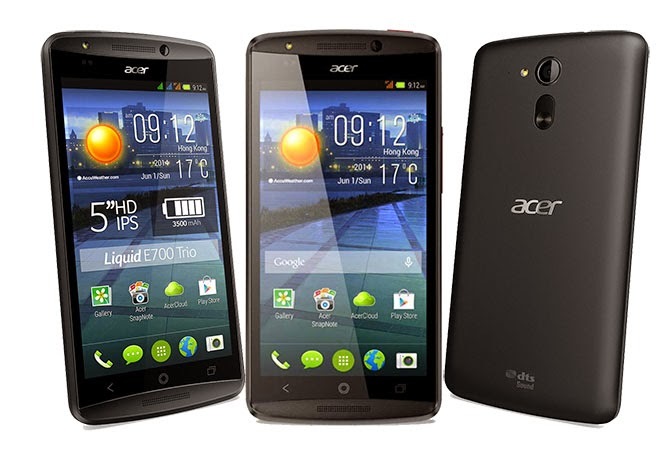 This Handset featuring triple SIM card support, Front Flash, 3500 mAh Battery as value added components. Definite edges and has a unique curved design that makes it comfortable to hold and carry. The body is entirely built of plastic with 5 inches IPS display (720x1280 pixels resolution and 294ppi), power button lies at the top edge. Handset feels solid, light and premium quality in hands. Acer added Float UI to perform multiple tasks easily, it includes many shortcuts for applications such as camera, calculator etc. The 1.2 GHz Cortex-A7 with 2 GB RAM can run highly-graphics intensive games but in heavy uses device get heated up. The battery is positive side of this handset with 3500 mAh Capacity runs for about 2 days in moderate use. 1.2 Ghz quad core with 2GB RAM –Gives smooth performance without any lagging . 3500 mAh long durable battery life. Front flash for secondary camera. Applications can be installed directly in external sd card. Camera picture quality is not so impressive. Speaker is on lower side Loud Speaker Volume – Average. No back light in buttons. Camera clarity problem- For better picture quality you can download 3rd party camera application such- Camera 360 from Play Store. 3500 mAh huge battery, Front camera flashlight, triple SIM card support. Its camera clarity may disappoint the people want good photos from the handset. Outdoor photos captured from the primary camera are average quality but in low light condition pictures become blur and unclear. The gaming performance is acceptable level but it gets heated in continuous gaming.